Antique Textiles Galleries Home Collection, LLC. (A.T.G.H.C.) is the leading resource for antique and vintage textiles in the Interior Design industry. Our antique textiles collection, sourced from all over the world, continues to enhance the interiors of many of the world’s’ top stylists, interior and set designers as well as architects. A.T.G.H.C.’s meticulously curated collection of antique and vintage textiles spans throughout centuries and continents. Our emphasis centers around rich embroideries from Europe and ethnic/tribal artisanal textiles from Asia, Africa and the Americas: a true global aesthetics scope. We offer a large selection of throw pillows handcrafted and designed in the USA. A.T.G.H.C. also carries an array of home furnishings, exclusively hand-picked by our creative team of world travelers. 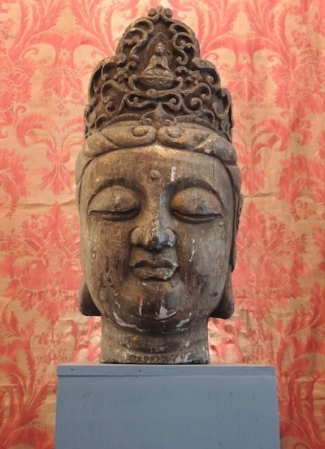 Our curated collection includes: rugs, decorative pillows, furniture and one-of-a-kind objets d’art. A.T.G.H.C.’s vintage and antique textiles and decorative pillows are exclusively carried by showrooms in New York, Miami and Los Angeles. Many of our textiles, tapestries and pillows are available through 1stdibs. A.T.G.H.C’s beautifully crafted and hand sewn work exhibits our creative eye for detail in made to order luxury throw pillows and furnishings with the exceptional textiles of our vast collection. As usual, our workshop continues to offer restoration and reconstruction services and now we also provide custom design to “make it your own”: A.T.G.H.C. would resize any pillow and/or provide them with a zipper or hand-closure to accommodate your design. For stylists and set designers our entire collection of fiber arts is available to you either for rental or on loan in lieu of press mention. A.T.G.H.C.’s contributions to philanthropy include in-kind donations to: First Kips Bay Palm Beach Show House 2017, New York Kips Bay 45th Annual Decorator Show House 2017 & Kips Bay 46th Annual Decorator Show House in 2018, Housing Works N.Y. and Miami Design on a Dime; the Holiday Show House in NYC, the Metropolitan Opera at Lincoln Center; the Ronald McDonald House on Long Island, NY and the Chabad House in the Hamptons.